The past two or three weeks have been busy. 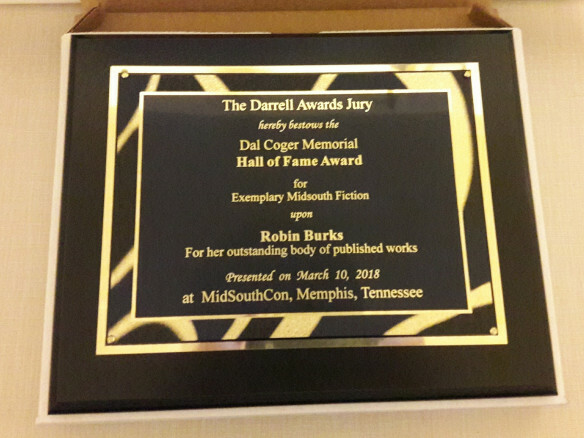 I went to MidSouthCon as a guest. I visited Knoxville. I skipped the St. Patrick’s Day parade (just too tired). I starting subbing again, after not being in a classroom for years. Two of my stories were published, and a third one was accepted. I received a royalty check for a story published in 2015. I need to update my website. This will just be a quick overview. I’ll do separate blog posts on the more important parts, with more pictures. I was on two panels at MidSouthCon, and spent an hour on Pro Row, attempting to sell books. I enjoyed the art show and was severely tempted by the dealers room. I attended as many panels as I could, especially the writing ones. My book-mate Melinda LaFevers and I, at MidSouthCon. We’re both in More Alternative Truths, and I’ve reblogged her blogs once or twice. My son’s college and my daughter’s high school had spring break the same week. This isn’t the normal course of action, so we took advantage of it by driving to Chattanooga to pick up my son from UTC, having a late lunch at Dairy Queen, then going north to Knoxville. We visited two or three museums, splashed in the hotel pool, visited some friends. and went bowling. The famous Sunsphere, at World’s Fair Park, gives a magnificent view of Knoxville, TN. We returned to Chattanooga Friday of spring break week. We took the kids to lunch at Mr. T’s Pizza (can’t go to Chattanooga without stopping at Mr. T’s), then took my son grocery shopping so he could restock his cupboard. We kissed him goodbye and drove home. The next day, I was supposed to march in the St. Patrick’s Day Parade as part of the Mid-South Renaissance Faire group, but I was too stiff and sore from spending most of the previous day in the car. I didn’t think I could manage the parade route without collapsing on the curb and had to bow out. After several years out of the classroom, I’ve gone back to substitute teaching. So far my classes have ranged from Pre-K to 3rd grade to middle school special education to 12th grade drama. I regret to say substitutitis has not changed since the last time I subbed, years ago. I’ve lowered my standards. When I first started my pedagogical career, I wanted to share my love of reading and teach the marvels of Western Civilization. Then I wanted them to indent paragraphs. Now, if the school doesn’t burn down on my watch, I’m satisfied, and if I manage to slip a snippet of information into their skulls, that’s icing on the cake. I was beginning to get a bit worried. It was supposed to take two weeks to get my fingerprints processed, but it was closer to three. I was beginning to wonder if my FBI file was responsible for slowing things down. Writers do have odd search histories, after all, and I have been less than polite to our current president on Twitter, Facebook, blogs, Inquistr articles, Alternative Truths, and More Alternative Truths. Frankly, I’d be surprised if I didn’t have an FBI file by now. I received my contributor’s copy of The Caterpillar, and have read some of the poems and stories in it to my students. Cat Tails: War Zone is now available. I had a story accepted by Fantasy for the Throne. I am waiting to hear on about eight more stories, one of which has been short-listed (bumped up from the slush pile to someone with the authority to say yes or no). I also received a small royalty check for a story I sold back in 2015, a pleasant if miniature surprise. 2. (Writing) Submit one story per month. 3. (Fitness) Get to Planet Fitness twice a week. 4. (Relationships) Date night with husband occasionally. 7. (Wildcard) Clean house. Kitchen April, dining room May, living room June. 8. (Wildcard) Proofreading for B Cubed Press and other clients. Larry Hoy and I will both be panelists at MidSouthCon.